Our workshop is state-of-the-art, equipped with the best tools and staffed by the best experts around. With over 50 years experience among us with all facets of bike service and maintenance you can be assured of the highest quality work on your bike. Our elite GURU bike fitting service is available to all customers. 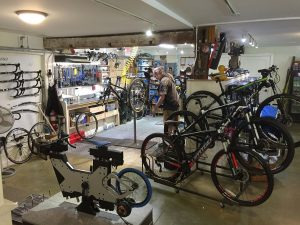 Our tune-ups include more than most bike shops. A Full Tune-up is $79 and should be done once a year to keep your bike riding like new. An Elite Tune-up is $109 and includes a complete drive-train cleaning. Tune Ups do not include parts needed to keep your bike running optimally. We always are fair in our estimates and only replace parts when necessary. During Spring and summer we ask that you contact us ahead to schedule since we are in high demand at that time of year and have limited storage. Use the contact form below or call us.